Best Chinese Knives: Titanium Paramilitary 2 Compression Lock Knife - Chinese sprint run! Titanium Paramilitary 2 Compression Lock Knife - Chinese sprint run! 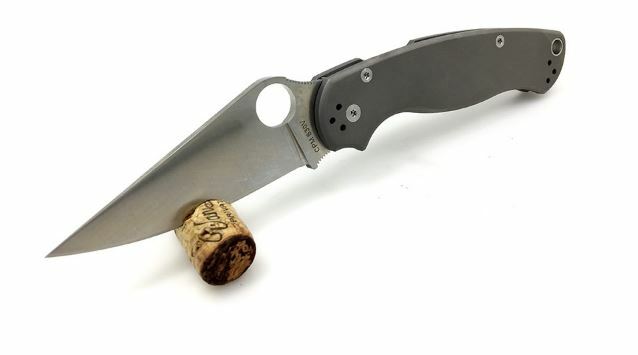 This knife should have been done a long long time ago by Spyderco. But while Sal Glesser and Co are busy producing the Paramilitary 3, the Chinese have stepped up and made this awesome model happen. At this point, I would really love to know if the scales would fit the genuine one, cause that would be amazing. The reported weight of this one is 6.35 oz (180g), but I suspect that this weight includes the package weight. This knife joins the already made Titanium Military, and I hope that it'll inspire the folks at Golden Colorado to produce a genuine one. Nice.. Let us know if you ever find out about the compatibility of the scales. These knives could end up being a gold mine for parts. I wonder if those screws are Ti as well? I think the screws come from a standard Para 2 clone, so they are steel. I will update about the scales ASAP. How do these compare to the real version? Is the quality close at all?